Download a blank fillable Dd Form 2630 - Software Description Annotated Outline in PDF format just by clicking the "DOWNLOAD PDF" button. 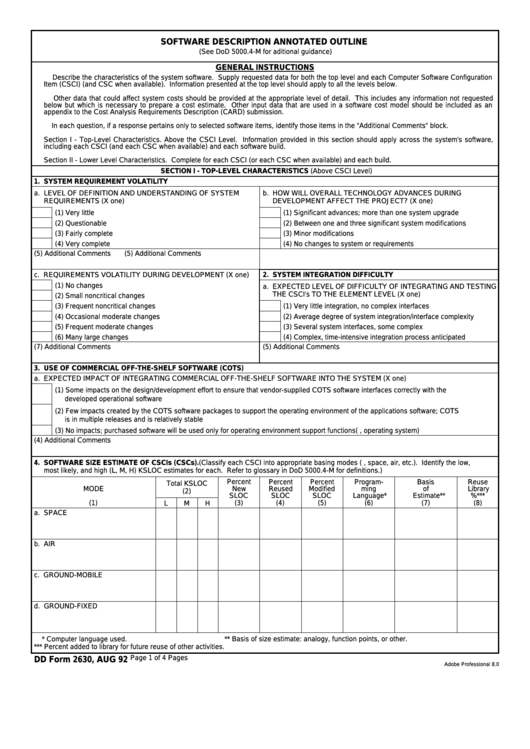 Complete Dd Form 2630 - Software Description Annotated Outline with your personal data - all interactive fields are highlighted in places where you should type, access drop-down lists or select multiple-choice options. Item (CSCI) (and CSC when available). Information presented at the top level should apply to all the levels below. appendix to the Cost Analysis Requirements Description (CARD) submission. In each question, if a response pertains only to selected software items, identify those items in the "Additional Comments" block. including each CSCI (and each CSC when available) and each software build. Section II - Lower Level Characteristics. Complete for each CSCI (or each CSC when available) and each build. ** Basis of size estimate: analogy, function points, or other. *** Percent added to library for future reuse of other activities.